For almost five years AS Roma has had its foot on the accelerator and can now position itself to the outside world no longer as simply a football club but as a media entertainment company. Its dedicated TV channel qualifies AS Roma as the only football club in Italy with a theme channel on the Sky Soccer and Sport bouquet that does not require an additional fee. And, because of the fact that the TV channel has developed such a level of programme output, it is the only football club that has also combined a radio channel in FM and via the web with a special app. Meanwhile, social media growth has been exponential. 2014 marked the arrival to the AS Roma media company of Fabrizio Preti, now head of sport and media technology. Preti told SVG Europe, “with my arrival as head of technology, broadcast and IT resources, AS Roma decided to significantly increase the speed and direction of the media side and to support the core business of the sports part with an important presence in the media world. “In that year, a Media Centre was created in Trigoria, the sports centre where the football team training sessions take place, precisely in order to maximise the proximity to the main content — namely the players and the sports activities. The radio channel covers the Lazio region on 100.7 and also is diffused via the web. 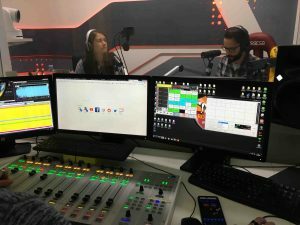 The intersection between radio and TV is very strong because in the morning the radio transmission is broadcast on the TV channel: that is on Roma TV a live radio transmission is broadcast, but it is accompanied by a suitable coverage of images, like a real live TV schedule. For example, when the anchors talk about the match of the day before or about the training in progress, or they present some insights about a football player, the gallery airs the suitable archive images. The media company houses a television production studio that joins two radio studios and there are various editing stations, off-screen commentaries and other graphic suites. The studio is purely for television and one of the two radio studios is also used for TV shots with corners properly set up as different shooting sets. Then there are editing and graphics suites, and everything is managed in a partnership with both technological and productive outsourcers – with the technological and productive resources belonging to the partner. Until last year this partner was Broadcast Solutions, and since October 2018 NEP Italia is in charge. 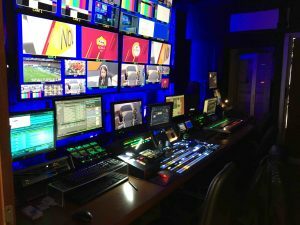 Fabrizio Preti said, “all the resources and people involved at a technical and production level are provided by NEP, while the whole editorial part is by AS Roma. The guidance of this complex organisation is shared between us and NEP Italia. All the needs and modalities of every issue are faced together. At the heart of the production is EVS equipment that handles all asset management, production, archive research and retrieval. There are news and highlights bulletins each day and many are created live, that is to say in the moment in which the games are played both by the Serie A team (not the live matches but immediately afterwards) and the female Serie A plus the youth teams, the Primavera at home and away, and the other youth teams like the Under 17s and the Under 15s. 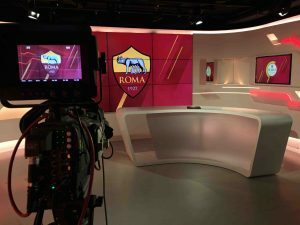 Since the 2014/15 season, the shooting of the Roma Serie A matches in the stadiums is also the prerogative of the AS Roma team and has been carried out since the 2018/2019 season by NEP Italia (in the past they were produced with Sky) and produced independently following the production regulation defined by the Lega Serie A. Several operational resources follow the team away from home, with at least one or two cameramen charged with interviews the evening before the match, connections before the game and the post-match interviews. With the Primavera team, almost always there is an operator in tow together with the journalist for the live connections and in most cases, backpacks with high-frequency radio links from Dejero are used. “We always push to be at the forefront of media production; for example, we were the first soccer team to complete a live match on Facebook and the first live on Twitter,” said Preti. “We rely heavily on these innovations: we were the first to create a hangout on Google with the help of the fans who took part in the show from home. We are always looking for innovations and for example, we are creating Augmented Reality content in the stadium village that is available to fans. Occasionally, based on the indications of the Lega Serie A, filming of the official matches of the first team is done in 4K, even if the media centre does not yet produce in 4K yet (since 2014 the production has been in HD). “The TV studio is limited in size, given that it had to be housed in existing structures. Up to four Grass Valley cameras with operators are used. For the most important productions we get to use five cameras plus a remote ceiling-mounted PTZ by Panasonic,” said Preti. Two Sony FS700s are used to create super slow motion shots in training and in the stadium. In the radio broadcasting gallery there are two remotely operated Panasonic cameras and also a GoPro action camera used to record a fish-eye view of the studio. Fabrizio Preti said: “All the news and real-time content we create is transformed into clips and immediately we are able to create stories and services relying on editing suites with Adobe Premiere, connected to the EVS system, which finalises all contributions. We have also implemented hybrid storage of our MAM archive with part of the content stored in the cloud, thanks to a project in collaboration with TIM. “On-site with EVS we keep the low-resolution version of all the content and the editing can access the entire archive. Obviously, when editing requires a part of the content stored in the cloud, it is necessary to calculate the retrieval time, optimised by the fact that the intelligence of the system allows it to recover even just the useful clip and not the entire content — and it also benefits from an advanced caching system.